Arts & Crafts bobbin and bar back birch rocking chair (ref 089). 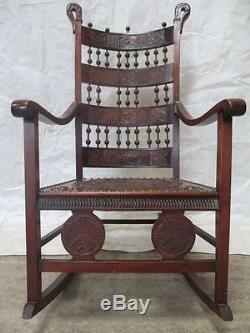 Arts & Crafts bobbin and bar back birch rocking chair with leather inserts and studded leather seat, carved scroll leaf finials to uprights (ref 089). All measurements are Width x Depth x Height from longest part. Inches 24.5 x 34 x 47. Cm 62.5 x 86.5 x 119.5. Please note that items for collection are held for 2 weeks unless prior arrangements have been made. Furniture items are held in store and 24 hours notice may be required to retreive them for collection. Items may incur a storage charge after 14 days where no arrangement is in place. All reasonable efforts to accommodate date and time for collection is made. The item "Arts & Crafts bobbin and bar back birch rocking chair (ref 089)" is in sale since Thursday, November 21, 2013. This item is in the category "Antiques\Antique Furniture\Chairs\Victorian (1837-1901)". The seller is "y-notantiques" and is located in y-not antiques. This item can be shipped to United Kingdom.